SOUTH HOLLAND, IL–South Suburban College (SSC) student Babatunde Adamson, of Hazel Crest, was recently sworn in by Marty Lareau, SSC Vice President and Board Secretary, for his first term as the new Student Trustee at the college’s April Board Meeting. He was warmly welcomed to his new post by Chairman Frank M. Zuccarelli. Adamson, 21, moved to the United States from Nigeria a little more than two years ago with his father and sister. He began pursuing his college education at SSC in the Spring 2017 Semester. His sister currently attends the University of Illinois–Chicago. “I have had a great experience at South Suburban; the college faculty and support services have really provided me with a good foundation for success,” said Adamson. Adamson is pursuing his Political Science degree at SSC and one day hopes to follow in his mother’s footsteps as a foreign services officer. 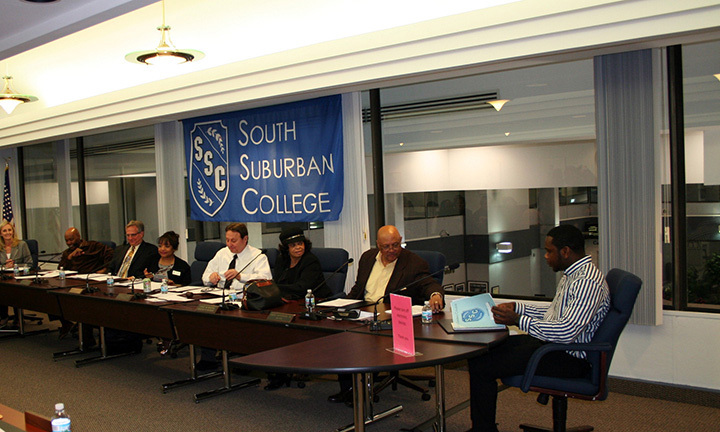 South Suburban College’s new Student Trustee Babatunde Adamson (pictured at right) took his seat for the first time at the April 11thmeeting of the Board of Trustees.